Caravans and motorhomes are all stored up! Secure storage sites can offer some of the best levels of protection for your caravan or motorhome – giving you that added peace of mind when you’re not using your leisure vehicle. And our latest community poll shows how popular they are, with outdoor secure storage topping the results. After more than 800 votes, more than half said they stored their caravan or motorhome at an outdoor secure storage site. Over a third of voters stored their leisure vehicle at home with a wide range of security measures in place. Eighteen per cent keep their motorhomes or caravans behind a locked gate or post and the levels of extra security varied. It was pleasing to read that many fit hitchlocks (caravans) and wheel locks, and have trackers and alarms activated. Some also have security lighting and CCTV installed to keep a watchful eye on their pride and joy. 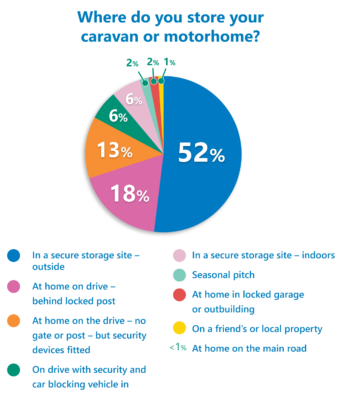 Thirteen per cent of voters, who don’t have a locked post or gates secure their vehicles with a range of security too, including caravan corner steadies or steering locks on their motorhome. And six per cent use their car or cars to block in their caravan or motorhome at the front or side. Plus it was great to see caravanners reporting that they store their caravan nose first to make it difficult for a thief to tow it away. Indoor storage sites only accounted for six per cent of the votes – but they can be quite difficult to find. And only two per cent of voters had enough space to lock their vehicle away in a garage or outbuilding. Seasonal pitches were also a less popular storage choice. If you’re considering storage for your caravan or motorhome, why not check out our latest video guide on what to look for in a secure storage site. And don’t forget we reward the security conscious caravanner or motorhome owner with a range of insurance discounts. For example, storing your caravan at a gold or silver CaSSOA rated storage site will give you some savings on your caravan insurance and motorhomes stored at sites with measures such as perimeter fences, CCTV and access control; or fitting a padlock to gates or installing a security post at home, can give you a saving on your motorhome insurance. Poll: Where do you store your caravan or motorhome? I have locked posts, electric hooked up, corner steadies lowered, hitch lock, wheel lock, ccctv, tracker activated, But if they want it it will be taken. It makes very interesting reading the varied storage options . Most owners are making the best of limited options and locations.